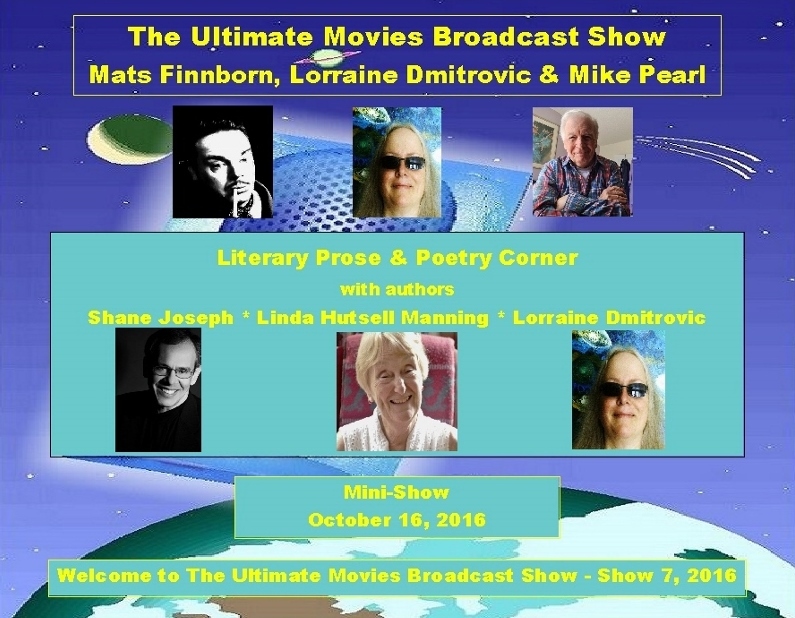 Mats Finnborn hosts Show 7 of The Ultimate Movies Broadcast Show, featuring the new segment, The Literary Prose & Poetry Corner. *Northumberland County, Ontario author Shane Joseph reads an excerpt from his book “In the Shadow of the Conquistador,” released in October 2015. Copyright © 2015: Shane Joseph. *Cobourg, Ontario author Linda Hutsell-Manning reads from the opening chapter of her as-yet unpublished novel, “The Tangling of Years.” The excerpt is Copyright © 2016 : Linda Hutsell-Manning. *Roseneath, Ontario journalist, author and poet Lorraine D (also co-host of The Ultimate Movies Broadcast Show) reads her in-the-style-of Shakespeare poem “Strategy – The Swagger Dance of Politics.” Copyright © 2002: Lorraine Chrystal Dmitrovic.